September 22nd marked the final day of harvest for us this year. I have to say, that was one of the earliest, easiest and most enjoyable harvests I have ever been a part of- especially after 2014’s nightmare of a fall. 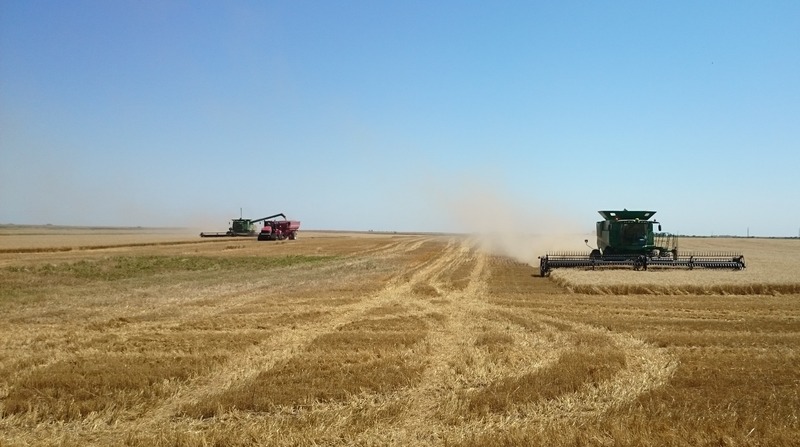 For the first time since I started this blog, I hardly wrote at all about harvest; I had neither the time to write (very few breaks) or the material to write about! Despite all that, the 2015 harvest was not all smooth sailing, and we are all more than ready for it to be done. Follow along and see how things went! Even with late summer sun, there just aren’t enough hours in the day at this time of the year. This was one of our earliest harvests ever. We fired up on July 29th, at least two weeks earlier than normal. 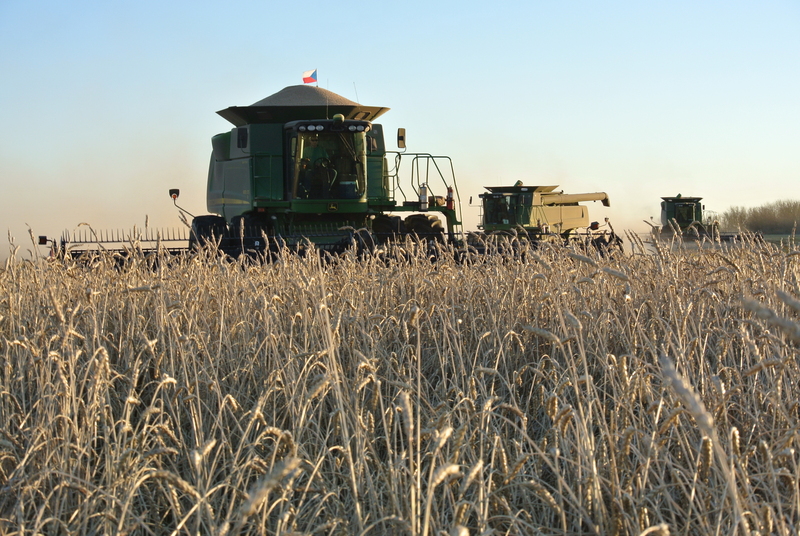 A hot and dry summer brought crops in very quickly, and our winter wheat was ready before we were. It took more than a few late nights to get everything ready for the field. You don’t just walk out to the shed, fire up the combine and go harvesting. No, these large, complicated and expensive machines require considerable care and attention to ensure they don’t break down during one of the most critical times of the year. 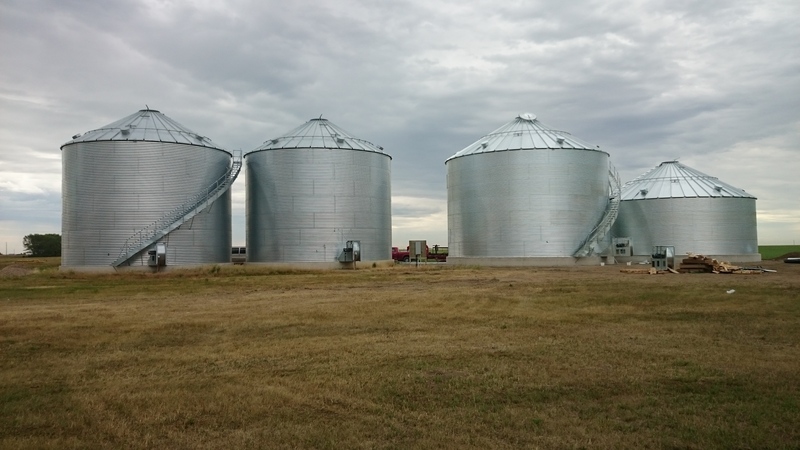 New bins helped us reduce the excessive amount of grain bags needed for storage. 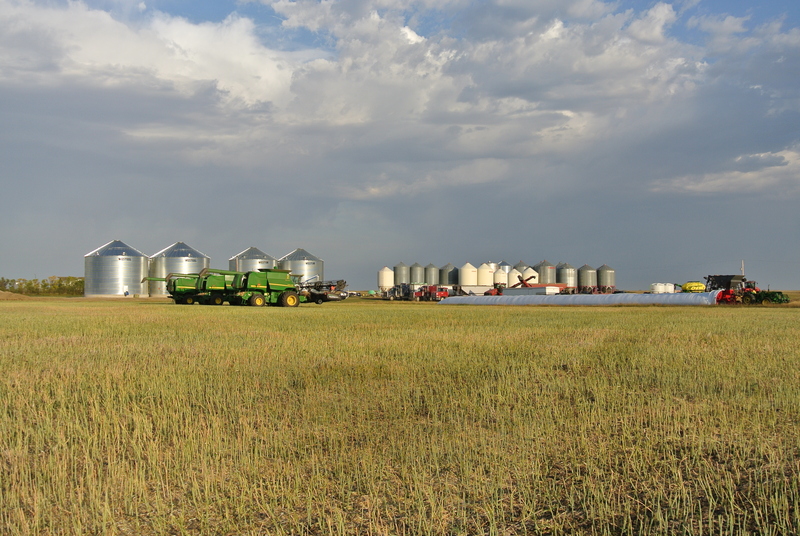 Last year, we needed over 20 bags, comprising close to 150,000 bushels of storage. This year, that number was cut by a factor of four, with a similar yielding crop. 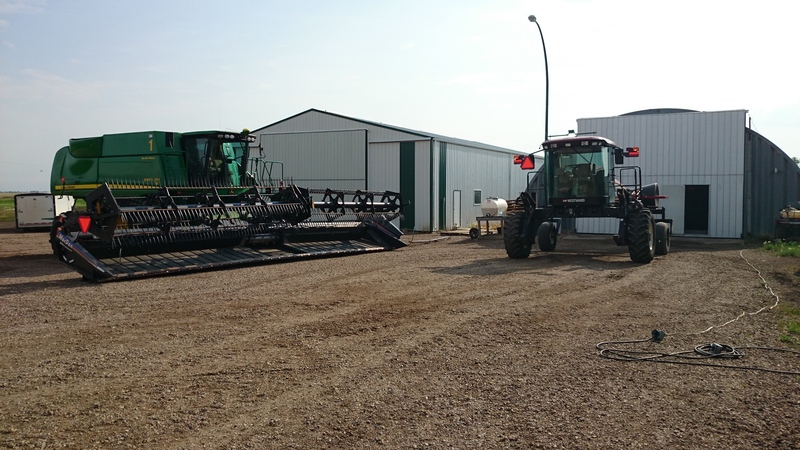 Along with the combines, several other items needed preparation, such as semi trucks and trailers, tractors, grain moving equipment, and various other machinery. Grain bins needed to be cleaned, temperature cables checked and tied down, and augers needed a thorough checking over too. 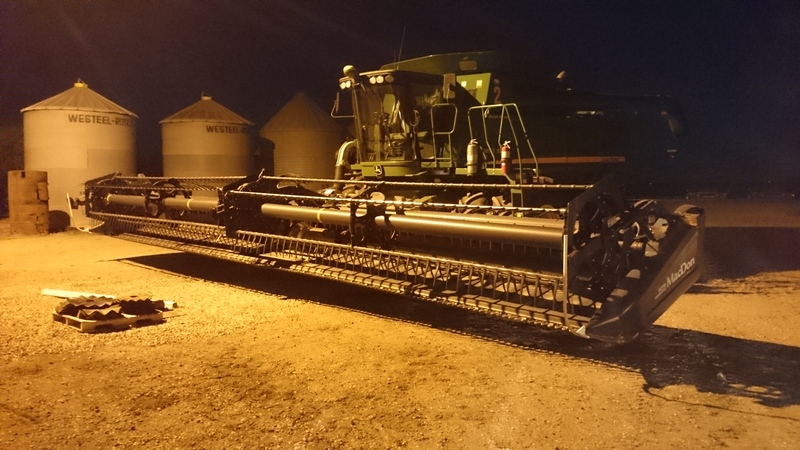 No matter how perfectly the combines run, if even the auger breaks down, everything is stopped. The entire chain has to be up to the immense task of harvest. 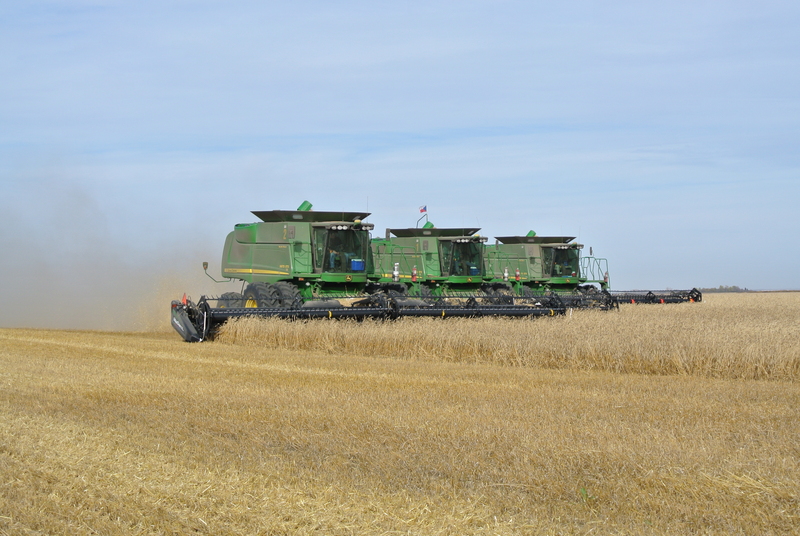 The first crop in the bin – winter wheat. 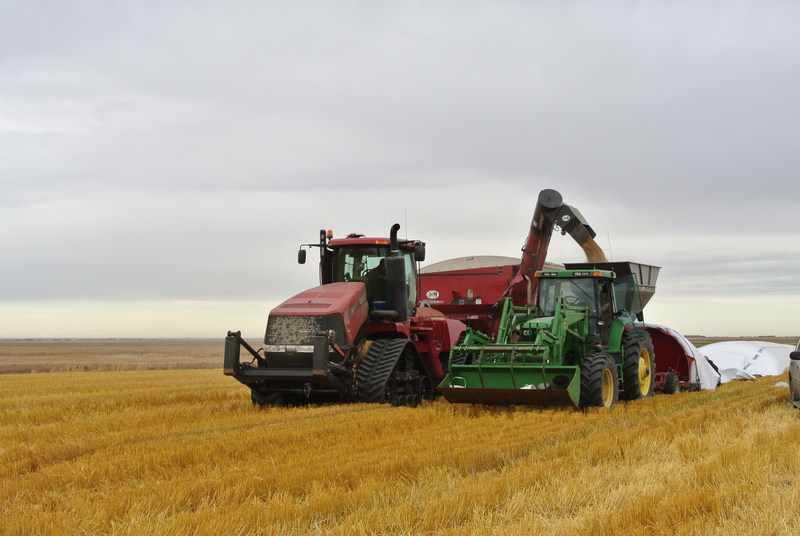 Winter wheat is a crop with advantages and disadvantages. On the plus side, it establishes in the fall, using up fall and early spring moisture that other crops give up to evaporation. It can yield very well as a result, and it is a nice way to get a crop off early. Unfortunately, that is also a major downside – you lose a lot of summer. With this picture taken on July 29th, we gave up half of our summer. Unfortunately, with the early heat and drought stress this crop faced in June, it wasn’t very successful this year. Lentils- not the easiest crop to get off the ground, but a very rewarding one. Sometimes, things work out better than you ever expected. While that doesn’t happen very often for this farm, this year it did. After I spent years avoiding growing this difficult crop, we finally eased back into them in 2014. Lentils are not water-loving, and the excessive moisture over the past 7 years really turned us off of this crop. 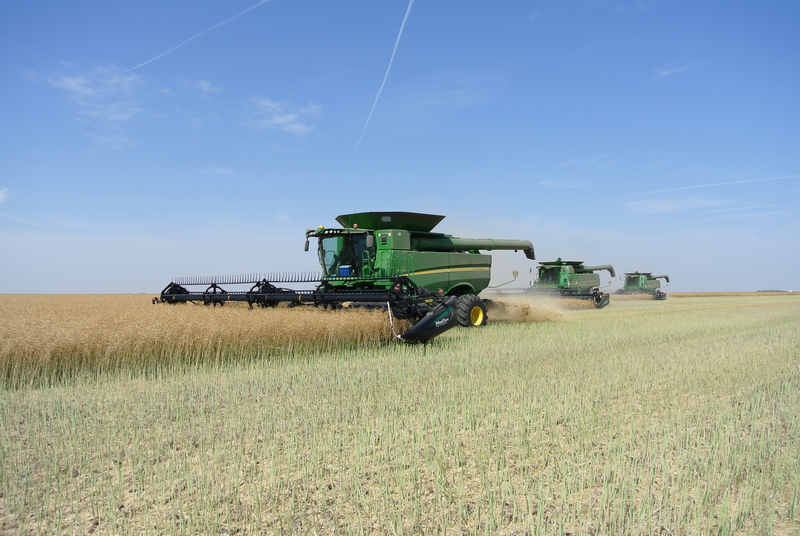 Ironically, the same heat and dry conditions that burned up the winter wheat allowed the lentils to thrive, and we pulled off some great yields. It was actually a lot of fun harvesting these things. 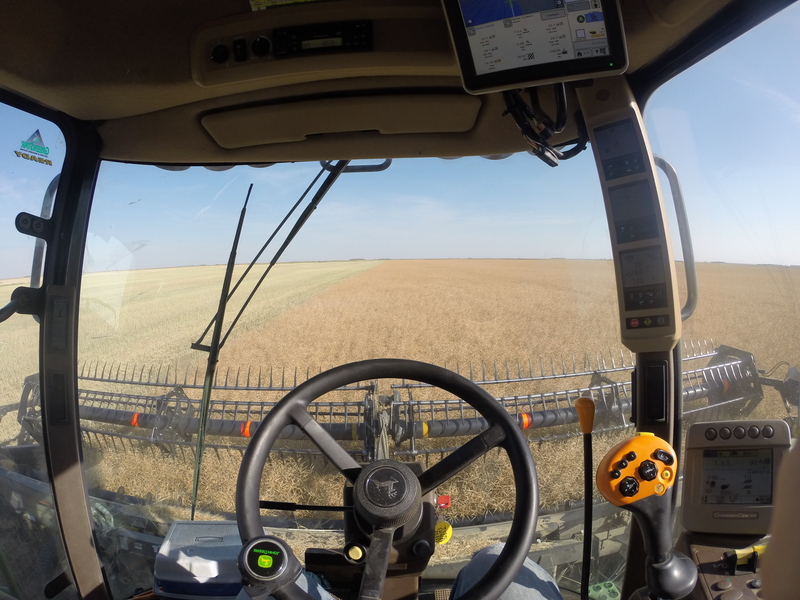 There were more than a few firsts this year: one was straight-cutting canola, and another was this awesome new GoPro camera (thanks Syngenta)! For those of you who have never seen the inside of a combine cab, this is my view out of one of our John Deere 9870s. These cabs have gotten so much better over the years, with fantastic comfort, quietness, and user-friendly controls. While this machine is already 7 years old, it’s hard to complain about running it. But, try sitting all day in it every day for a month. Everything gets old after that. 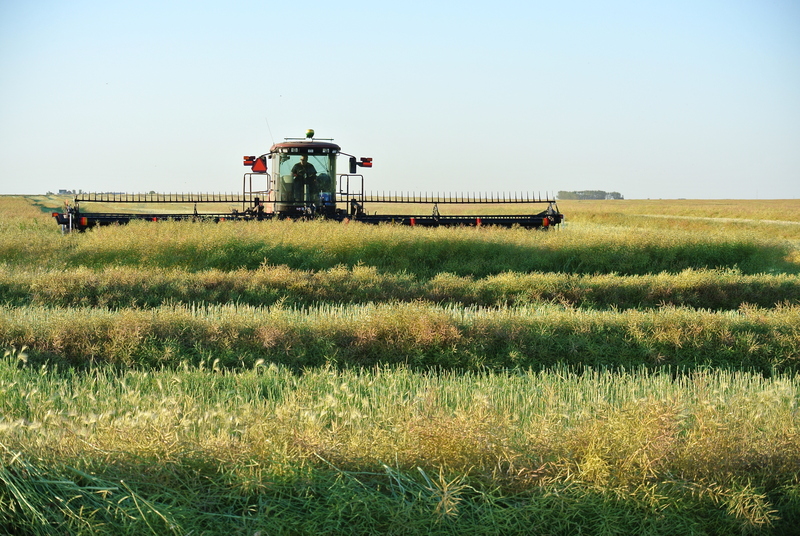 Straight-cutting canola had its challenges, but the pros outweighed the cons. Straight-cutting canola was a mixed experience. We learned a lot from doing it, which you can read more about here, but suffice to say it won’t be the last time we try it. We learned that the pod-shatter resistant varieties are worth the money in harvest efficiency, and we learned that if it’s not ready, it’s not ready. Four hours spent unplugging one of our machines was a harsh lesson for us on that one. Any way we can cut down on swathing is a positive for us (I despise swathing) and it keeps more of us around to combine. I look forward to continuing the experiment in 2016. Trucking may not be as glamorous as combining, but it is every bit as important. I think when people imagine harvest, they tend to think more about the combines and less about the support crew. It looks like way more fun, right? Unfortunately, while that is probably true, combines are the easiest machines to operate in the harvest mix… which means that Dad, Sarah and I rarely get to run them. 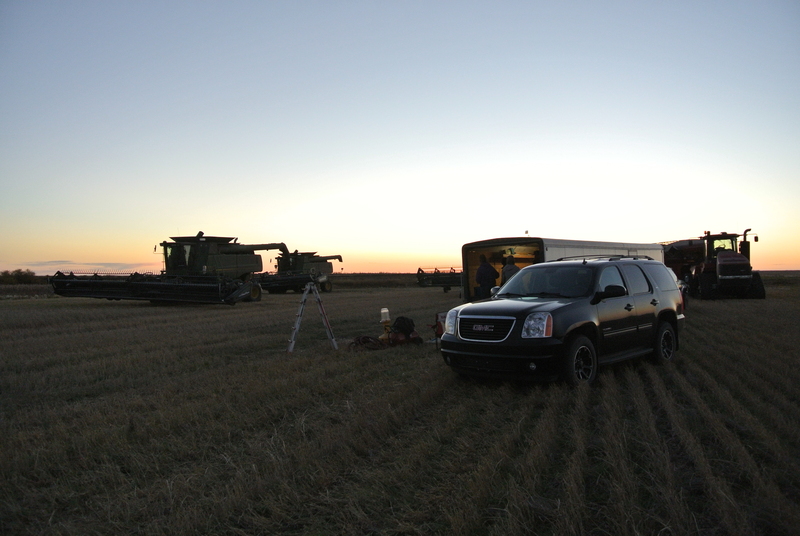 I think I only ran a combine for a total of two days this year, which was mostly evenings. We spend most of our time with logistics: getting the grain from the combine into storage without slowing them down. 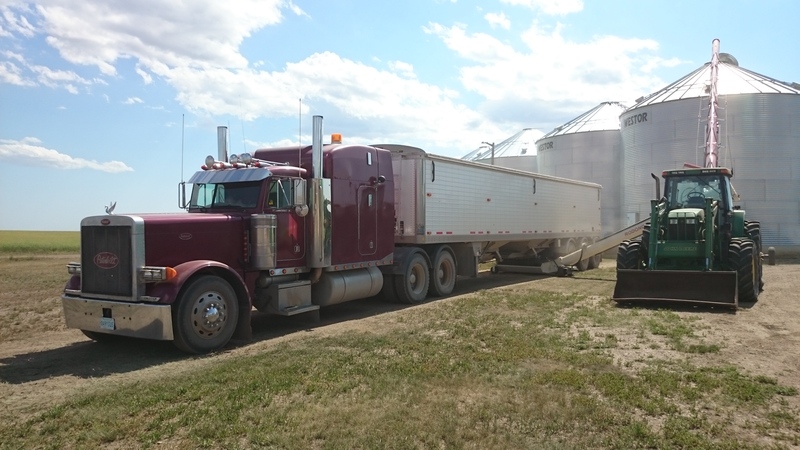 The process involves two or three steps: 1) using the grain cart to get the grain out of the combines and into the semis; 2) getting the semis unloaded into bins, or, and this is where step 3 comes in, into bags. Grain bags have some downsides, but we can’t go without them. While grain bags are difficult to work with (they are rather heavy to lift onto the bagger) and are all too attractive to wildlife (I have learned to hate raccoons), they are a fantastic short-term tool. Sometimes, the bins are just too far and the trucks cannot keep up. Other times, we are short on people to run semis. Besides, at the end of the day, we just don’t have enough bins for an above average crop. Grain bags fill all of these gaps, and keep those expensive combines moving at capacity. 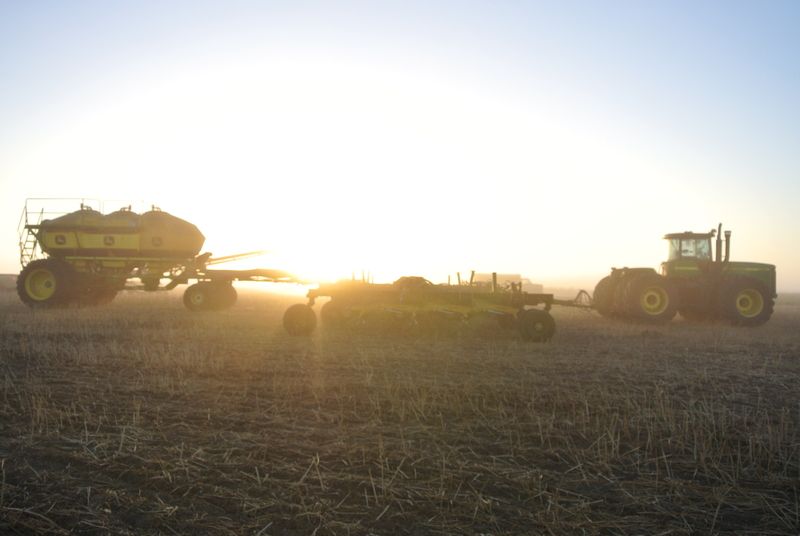 The most difficult job to complete every fall is seeding. 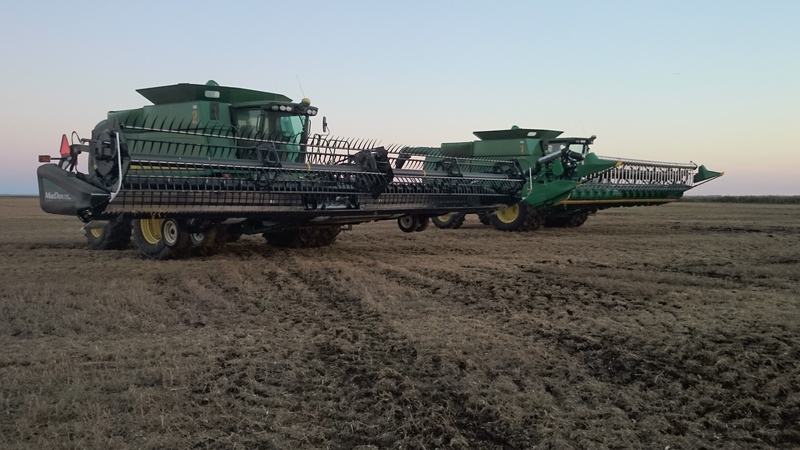 Trying to keep three combines moving, harvesting over 25,000 bushels a day, and then finding a way to go and plant seed and fertilizer on 1,600 acres seems a recipe for disaster. Managing the logistics during the actual seeding season is difficult enough! Nevertheless, we always try and find a way to get the job done. 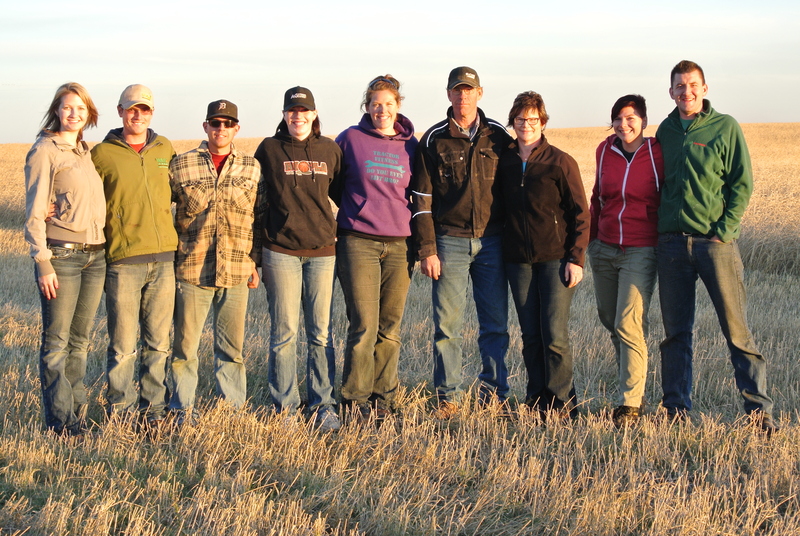 The great thing about this harvest was that we were almost finished when seeding started! Now that is a nice change of pace. In fact, we actually finished harvest (aside from the soybeans) as we really got rolling seeding. 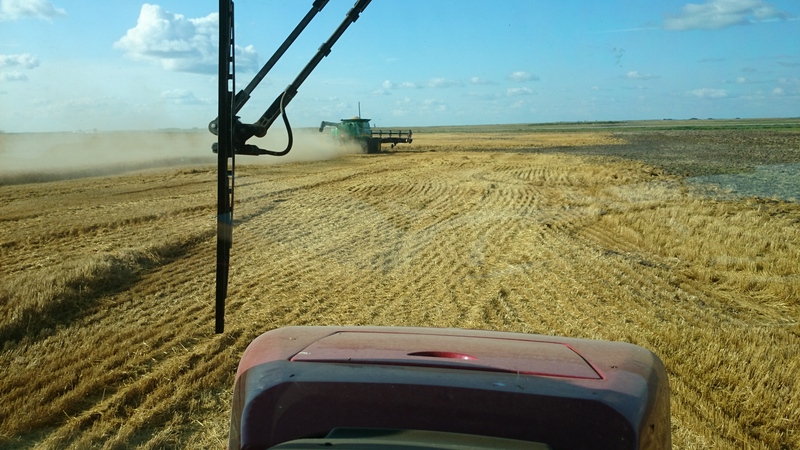 Getting the winter wheat in was not the challenge it usually is – but starting a job of this scale with over a month of harvest behind you takes a real effort. Running 15+ hour days for that long wears you down, to say the least. As the end looms, logistics becomes a greater and greater challenge. As “easy” as this harvest was, after over a month of steady combining, you really start to wear down. Once the main binyard fills up, you start looking at anything that resembles a bin to try and store as much as you can. By the time we got to the flax, we finally broke down and rented a couple of 5,000 bushel hopper bins to take the pressure off. The good news was that we got a two week break after finishing the flax, before the soybeans were ready. That gave us some much needed time to get some bins empty and do some required maintenance – and to catch up on sleep. A frosty morning reminded us that fall had begun – and it was time to be finished harvest. While late September is by no means a late finish to harvest, with a late July start, we had been in harvest mode for nearly two full months. This photo was taken the morning of our final day of harvest (excepting some low spots) and it was clear how the weather had begun to change. 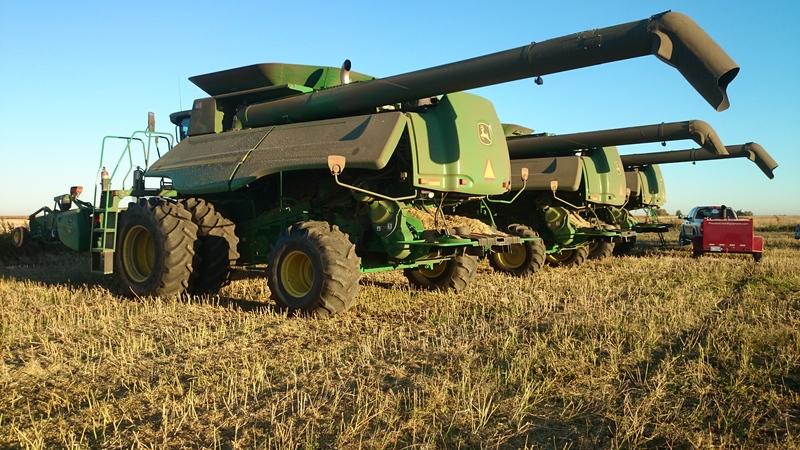 For the first (and only) full day of the year, I got to run our newest combine, our S680 John Deere. It made the final day breeze by! 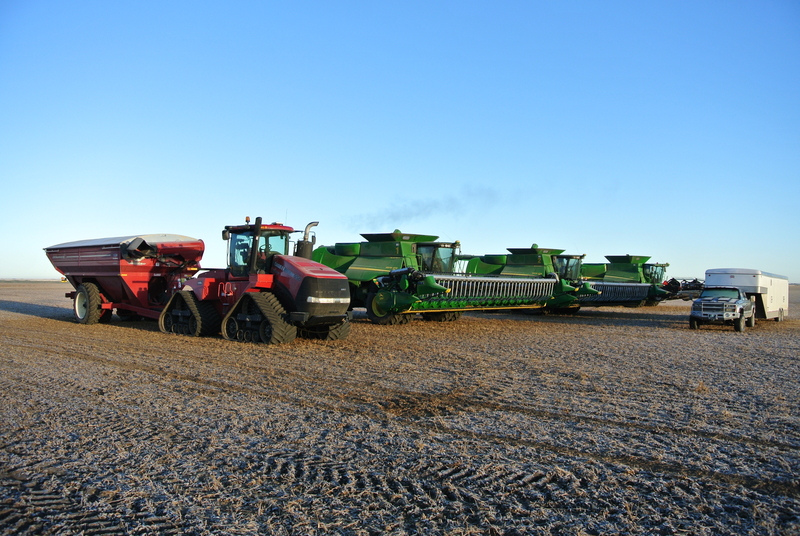 When the smoke cleared on the 22nd of September and the combines entered the yard for the final time this year, we finally got to take a breath and look back on the year that was. 2015 was largely a hot and dry year, but excellent subsoil moisture from a very wet 2014 and a few key rains helped us bring in an above average crop. It’s not very often you get a harvest as relatively easy as this one with a great crop! 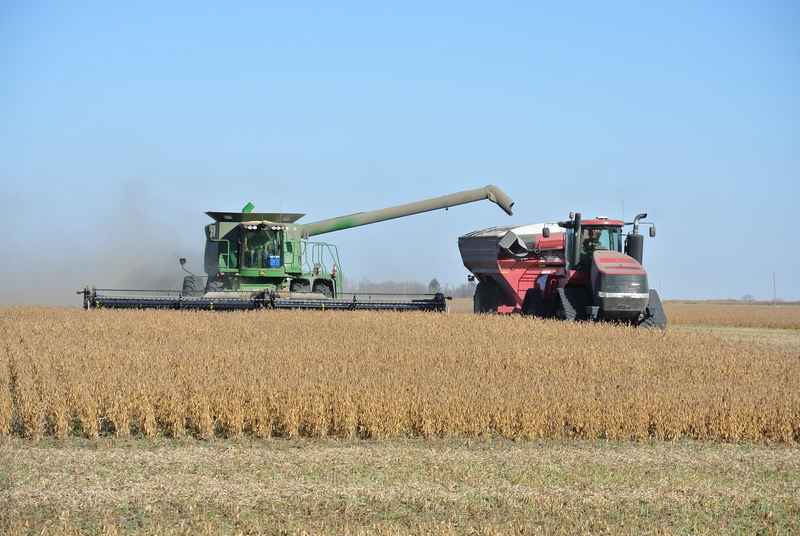 After 56 days, 1200 combine hours and nearly half a million bushels of grains, oilseeds and legumes, harvest 2015 has been completed. There is little time for rest though; we have grain to haul, disking and vertical tillage to do, fertilizer to spread and spraying to finish, all before freeze up starts in (hopefully) a little more than a month. But, these jobs aren’t harvest – the crop is in the bin. 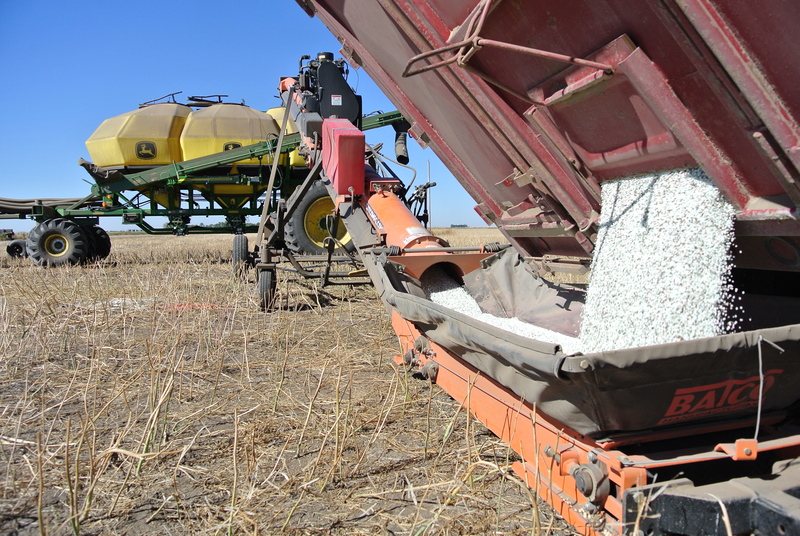 One of the strangest experiences during harvest is its polar opposite – seeding! 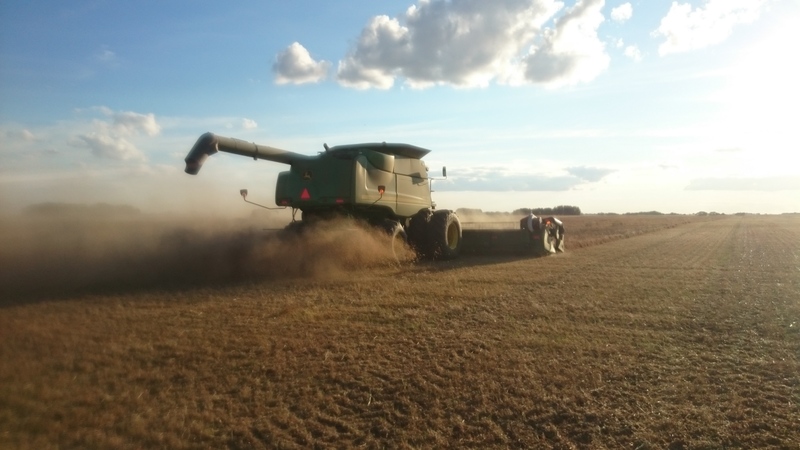 Although winter wheat planting is difficult to accomplish during the busiest time of the year, it is usually a worthwhile endeavour; saving time and inputs during the other busiest time of the year, seeding. An early morning for the maiden voyage of our new air drill! When we seed in the spring, all hands are on deck to sprint the marathon of planting the year’s crop. It is a busy, stressful time of the year, when you put everything on the line to seed a crop in the extremely short time window that is available. 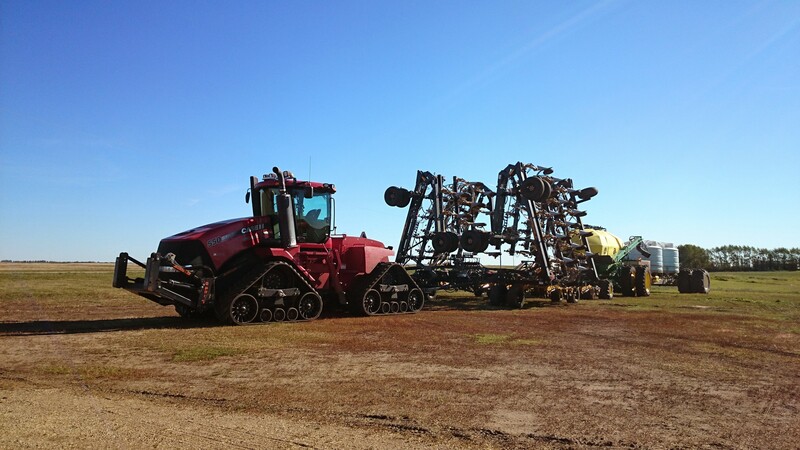 You are seeding multiple different crops with varying fertilizer plans, ensuring as few mistakes as possible are made, as every wrong decision can bring disasterous consequences. Fall seeding, by comparison, is relatively relaxing. While harvest wore on, I spent close to a week seeding mostly on my own. I had help from my wife when she was home from work, as well as from others early in the morning. For the rest of the day, I had to load trucks and load the drill on my own. This is a big project for one person. It comes with very early mornings and long days, trying to keep everything moving without disturbing the harvest crew, which of course takes precedence. Sacrificing time harvesting this year’s crop to plant next year’s is akin to the “bird in hand versus two in the bush” analogy. Despite all of this, I get to work at my own pace, which is not the marathon spring seeding normally is. Winter wheat is grown all over the world, mostly with greater success than we experience here. Our long, cold winters are very harsh for this crop, and as such we must give up the higher yielding varieties from the south for winter hardiness. Even with these tougher varieties, a winter without much snow (which does happen from time to time) can virtually kill of this crop if temperatures dip below -25 degrees Celsius (which happens often). For these reasons, careful management of winter wheat is a must. Selecting the right varieties and seeding at the right time can make all the difference. I seeded ours from September 10-15. Like every crop, winter wheat requires a clean field, so we sprayed it for weeds about 2 weeks before seeding. Like other wheats, it also requires large fertilizer amounts. We applied a fair amount of slow-release nitrogen, but we will top up in the spring if the crop looks good. 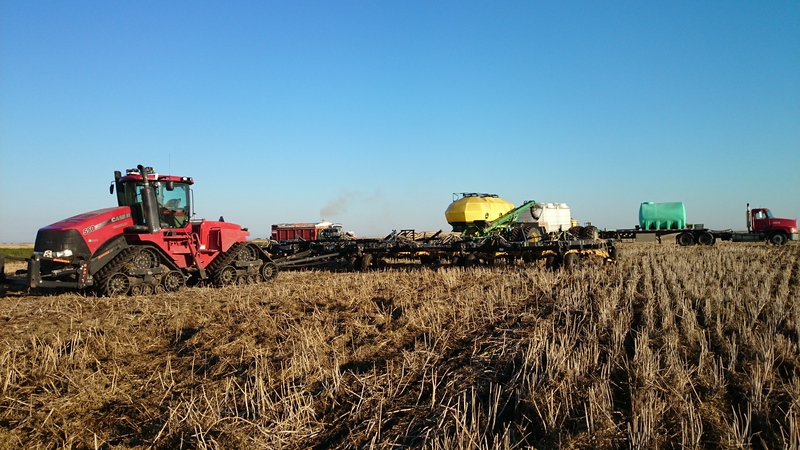 Loading the drill with fertilizer – it needs a lot of it! Can you grow winter wheat organically? Sure, but you won’t be happy with the weedy, weak stand that will most likely not yield enough to even make the land rental payments. If you are going to strip the seeds from your plants, you are removing nutrients from the soil. How will you replace them without fertilizer? If you mine your soil, it will eventually fail you. Just ask anyone who farmed in Saskatchewan in the 1930’s. Farming requires a great deal of optimism (or foolishness, take your pick) and seeding winter wheat is no exception. Just when you finally get your crop in the bin, you go and plant another one, with a whole new set of risks and rewards. Will it germinate in the fall, typically one of the driest times of the year? Will it survive winter? If it does, it has great potential for the following spring, and really reduces the workload in the spring. Farming is all about risk management. Rain can be very damaging to mature crops at harvest, so we plant a crop that will benefit. It’s just like your retirement portfolio; full of different investments that respond to different market events to reduce your exposure to market fluctuations. In essence, this is what we do with every crop, every year. At least, that is what we try to do. It doesn’t always work. All we can do is hope that it does.